Well, after all the fun shenanigans last week in NJ, I expected to be feeling a bit down this past week, and I was right. It was SO. NICE. to step back into the warmth and humidity of Palm Beach last Tuesday night, but I really miss everyone. I have the blahs. Total weight gain: I have gained 4 lbs. since my last appointment. That's 4 lbs. in just over 2 weeks. It is good to gain about 1 lb. per week each week during the second trimester, and I've gained 2 lbs. per week the past couple weeks. I am guessing this is actually a good thing, seeing as I lost weight during my first trimester. My body is doing a little catching up. I feel good about my body and my growing bump, which is where all the weight is going at the moment, but this is the first time during my pregnancy that the little voice in the back of my head started obsessing over weight. I KNOW I will combat this, because I know I am doing exactly what I need to do to keep myself and my baby healthy. I'm sure a lot of women face these thoughts during pregnancy, not just someone with my history. Our whole lives, society has conditioned us to want to be the thinnest, fittest, strongest, most "ideal"-bodied women we can be. That mindset carries over into pregnancy, at least for me. It's hard for me to be okay with seeing the scale go up so rapidly, especially when I see that I've gained more than what is recommended in a week, even though I know it is a good thing. Unless my doctor tells me there is a problem with my weight, I am going to continue doing exactly what I've been doing: eating when I am hungry, balancing healthy choices with treats, staying active, and only getting weighed at my scheduled doctor appointments. Best moment this week: There were TWO best moments that made me forget about the blahs! 1. We registered at Buy Buy Baby! It was overwhelming, but it would've been a hell of a lot worse if we hadn't done our research ahead of time. We still need to put a bunch of little things on there, but we pretty much knew most of the big ticket items we wanted/needed. Eric zoomed the stroller around the aisles, and we kept referring to the Mamaroo as the "spaceship," because we are role model parental figures, obviously. We also set up our Amazon registry. We are nowhere near done editing and adding things, but it was a fun day. Movement: Yes! He moves A LOT. He had the hiccups during the ultrasound today. It was so cute. Any time I am sitting still, he starts moving. I can't wait til he's bigger and starts kicking my spine and bladder and cervix when he's annoyed with me. This guy is going to keep me on my toes! Food cravings: Just sweet things. I've been eating apples and peanut butter again! HOORAY! Anything making you queasy or sick: Just the thought of grilled chicken... ew. HERE ARE HIS BOY PARTS! 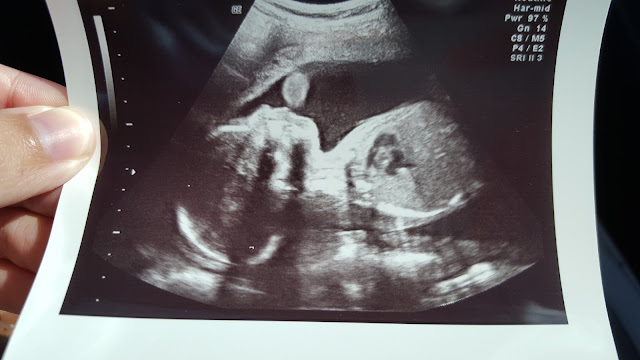 The tech said there is NO DOUBT he is a boy. 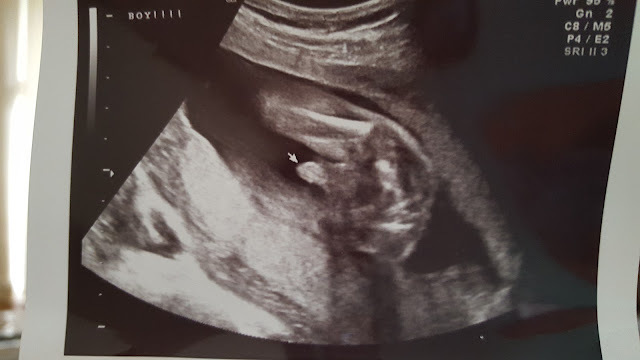 She didn't print this picture for us, but the doctor handed it to us when we met with her, because she said it was a great shot of his anatomy. Hehehehehe. Symptoms: Same old. I'm feeling pretty good! Happy or moody most of the time: Moody this week, but that is to be expected when I leave NJ.